Your intranet is essential to business productivity — so it had better work fast. For the last 4 months, our team has obsessed over caches, calls and queries to bring you a ThoughtFarmer that is up to 35 times faster than its predecessor. We’ve called our latest release Bamboo — because it’s light, strong, and ridiculously fast. We’ve also added some extra features to make your intranet faster and easier to use, including mobile photo upload, integrated web forms, and mini profiles. Completely transforms the user experience for slower connections, such as airport wifi or poor mobile reception. This is also key for companies with employees in remote destinations. Lets users get work done faster, often with near-instantaneous response times. 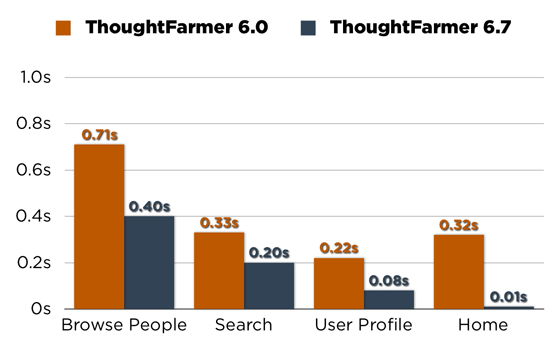 ThoughtFarmer page processing is dramatically faster in the latest version. Overall throughput has increased three-fold, with some pages up to 35 times faster. Ever wanted to share a photo from a conference? Upload pics of your most recent staff event? Take a snapshot of your whiteboard? 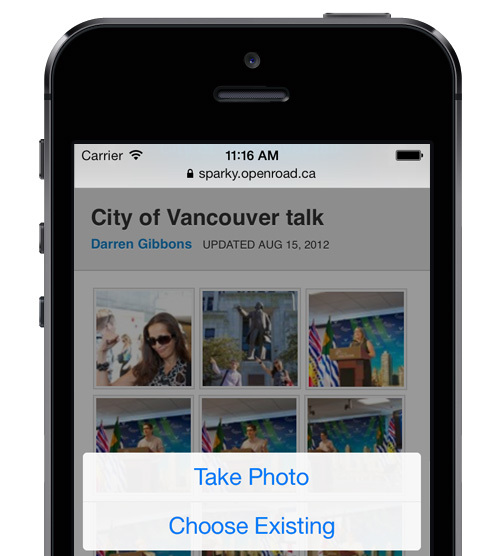 ThoughtFarmer now lets you upload photos directly to your intranet from your iPhone. Wufoo is a best of breed online form builder, popular amongst many of our clients (and pretty much anyone who has ever managed a website). We’ve developed built-in Wufoo integration, where you can simply add your Wufoo credentials to the admin panel. Once done, content creators can use the Wufoo button to add a form to any intranet page. ThoughtFarmer always puts content in its social context: you can see who created it, who edited it, and who commented on it. 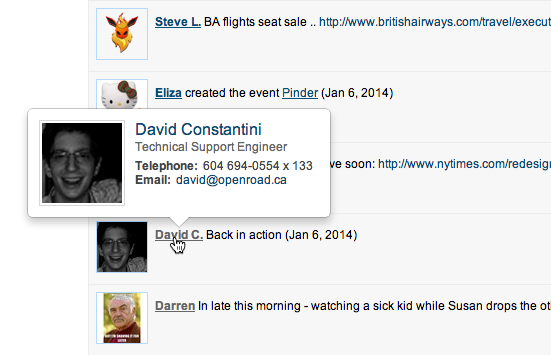 To enrich social context, we’ve added a mini-profile that appears whenever you hover over a person’s name. Quickly view their title and contact info from any page. More Languages: ThoughtFarmer is now available in Portuguese and Russian. Calendar Support for Mac: You can now subscribe to your intranet calendars from your Mac. The most important intranet feature? Speed.